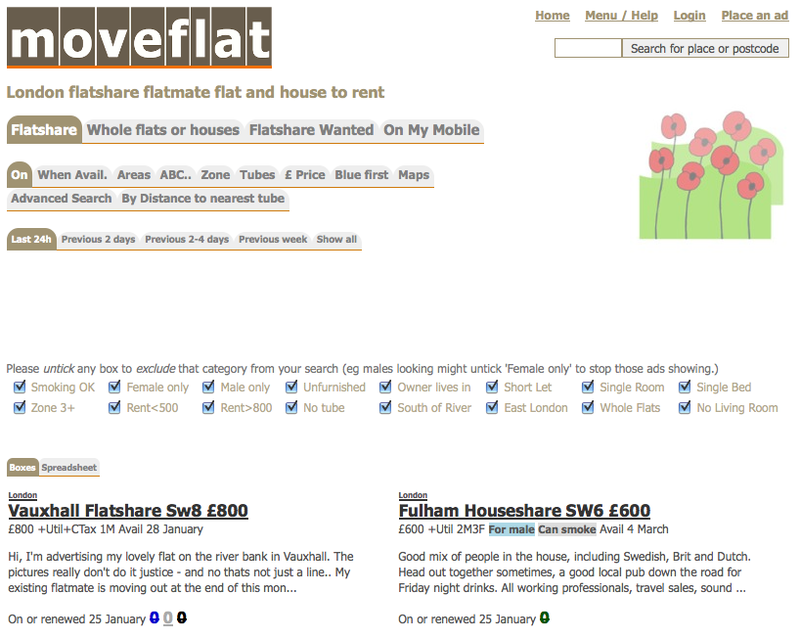 MoveFlat is a nice, quality flatshare website for flatshare property and accommodation rental in London. Looking for rooms to let and property to rent has been made easy, meaning that renting in London no longer has to be a struggle. From apartments to cheap flats, a wide range of properties can be found with all the necessary information provided. The only downside is the limited amount of properties advertised, and the somewhat steep prices for the ones that are. Provides a detailed description of the flatmates, so you know exactly who you’ll be moving in with! MoveFlat is perfect for those looking for a quick place to stay. With detailed information on the flatmates, you can decide is exactly where, and who, you want to live with. However, Moveflat is not ideal for those on a budget. Remember that the website doesn’t offer a wide variety of ads so you will probably also need to use another accommodation site. Go back to our Long Term Accommodation in London section for a list of the best sites offering accommodation in London.